The narrow land between the Andes and the Pacific Ocean offers a long coastline with beautiful small coastal towns, large vineyards and wonderful national parks with great variety in landscape and climate. Chile mainly draws tourists interested in great nature experiences. Chile is one of Latin America’s safest countries and is therefore suitable for travelers who have not previously been in Latin America. San Pedro de Atacama – The small town with sandy streets is the base for many tourists looking to explore the Atacama Desert. Atacama Desert, a unique place with vast salt pans and brown rough stone terrain with active hot springs and stunning salt lakes. The area also offers one of the clearest night skies and a tour of the starry sky is available at several observatories in the area. 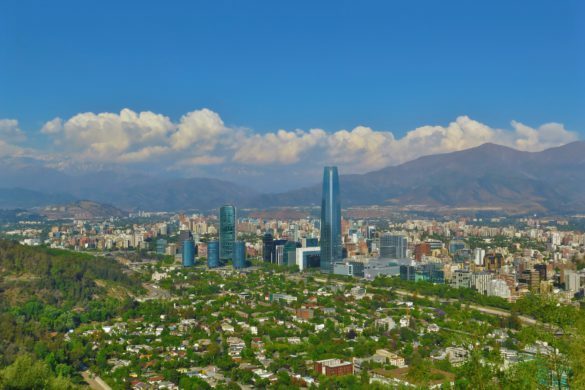 Santiago de Chile – The capital of Chile is a modern and energetic metropolis that is planted in the middle between the vast snowcapped Andes. The city is known for the blend of modern and colonial architecture, that stand in beautiful contrast to each other. Santiago has a good selection of museums, restaurants and nightlife. There are also good opportunities for day trips to the great vineyards outside Santiago in summer time. In winter visitors come to the major ski centers: Portillo, Valle Nevado, La Parva and El Colorado-Farellones. Valparaiso and Viña del Mar – You can combine a journey to these two coastal towns with a stay in Santiago. The former is an untidy but charming town with houses in all colors of the rainbow. Vina del Mar in contrast is a beach town with beautiful parkland and hotels, which draws tourists mainly over the summer. Pucón – One of Chile’s most popular destinations. The city primarily draws adventurous tourists because of its good facilities for hiking, rafting, zip-lining and canyoning. The town lies just below one of Chile’s most active volcanoes Villarica and the beautiful lake Lago Caburgua, and the nature of the area also makes this a good destination for those not fully so daring. Torre del Paine – Chile’s most renowned national park that is primarily known for the magnificent mountains that rise over the park as well as the good hiking trails that take you through the park. You can take long trips as well as tours for up to 9 days. There are possibilities for accommodation inside the park. Accommodation in Chile is priced higher than many of its neighboring countries. During the peak season of January and February prices will be slightly higher than the rest of the year. Most hostels and hotels will offer discounts during off-season, but you must ask for it. Outside season it is rarely necessary to book a hostel/hotel in advance. Prices start at around 8000-10000 CLP (from 12 USD) for a hostel dorm per night. For a private room you must expect to pay a little more. The hotels range from 50000 CLP to 90000 CLP (from 75 USD) per night in Santiago and other large cities. Most places include breakfast. The bus system in Chile works surprisingly well and is an affordable way to travel throughout the country. The major bus companies like Pullman and TurBus take you just about anywhere in the country. The buses are comfortable and cheap, and run both day and night. Try to order a bus ticket ahead of time and ask if they have seats called “cama” (fully reclining) or “semi-cama” (semi reclining) for a pleasant journey. You can also use a bus to cross the borders of Argentina, Bolivia and Peru. If you want to rent a car, you can choose between six known rental companies that operate at the Santiago airport. To drive a car in Chile is not as challenging as compared to other countries in Latin America, but the traffic goes something fast. The roads are well maintained in the cities, but may vary in rural areas. 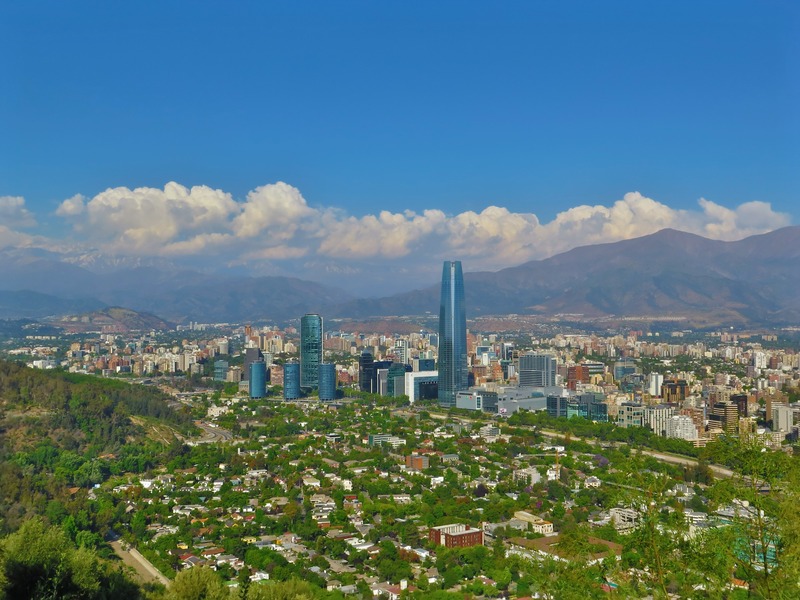 Santiago is a busy city and it can be a good idea to leave the car while in the city. Public transport in Santiago is cheap and effective. For information about transportation in Santiago visit Transantiago. When to go – When you should to travel to Chile depends what you want to do while in the country. The summer months from November to February are the peak season for most destinations. Temperatures and prices are somewhat more pleasurable from September to November and March to May. If you on the other hand wish to simply go skiing then to time to visit is during the period of June to August. Costs – Chile is somewhat more expensive than other Latin American countries. but in return you won’t be cheated on prices. There is little visible corruption in Chile and you will get a receipt for everything you buy. Haggling is not common, with perhaps the exception of hotels. You can find ATMs in all major cities. Even though many places accept credit card, you should still carry cash. Tipping – Generally 10 – 15 % at restaurants. Other than that it is not necessary to tip. Food – Make sure to enjoy seafood while at the coast, and drink plenty of Chilean wine. Eat Pastel de Choclo, Cazuela, Empanadas and Plateada. Drink Mote con Huesillo, Chicha, Terremoto and Pisco Sour. Culture – Chileans have a relaxed attitude when it comes to time and it is not uncommon that they show up 20 minutes past agreed meeting time. For parties and other social activities you should expect even longer. Men in Chile greet by shaking hands. Men and women greet each other by giving a kiss on the right cheek.